One of the most studied techniques for the non-destructive determination of the internal quality of fruits has been visible and near-infrared (VIS-NIR) reflectance spectroscopy. This work evaluates a new non-destructive in-line VIS-NIR spectroscopy prototype for in-line identification of five apple varieties, with the advantage that it allows the spectra to be captured with the probe at the same distance from all the fruits regardless of their size. The prototype was tested using varieties with a similar appearance by acquiring the diffuse reflectance spectrum of the fruits travelling on the conveyor belt at a speed of 0.81 m/s which is nearly 1 fruit/s. Principal component analysis (PCA) was used to determine the variables that explain the most variance in the spectra. Seven principal components were then used to perform linear discriminant analysis (LDA) and quadratic discriminant analysis (QDA). QDA was found to be the best in-line classification method, achieving 98% and 85% success rates for red and yellow apple varieties, respectively. The results indicated that the in-line application of VIS-NIR spectroscopy that was developed is potentially feasible for the detection of apple varieties with an accuracy that is similar to or better than a laboratory system. This work was partially funded by the Generalitat Valenciana through project AICO/2015/122 and by INIA and FEDER funds through project RTA2015-00078-00-00. Victoria Cortés López thanks the Spanish Ministry of Education, Culture and Sports for FPU grant (FPU13/04202). López, A. F. (2003). ‘Manual para la preparación y venta de frutas y hortalizas, del campo al mercado’. PDF File: Boletín de servicios agrícolas de la FAO, 151. http://www.fao.org/tempref/docrep/fao/006/y4893S/y4893S00.pdf. Accessed 20 Aug 2018. Song, W., Wang, H., Maguire, P., & Nibouche, O. (2017). 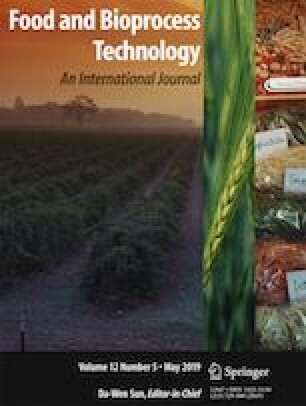 Differentiation of organic and non-organic apples using near infrared reflectance apectroscopy – a pattern recognition approach. In Unknown host publication (pp. 1–3). https://doi.org/10.1109/ICSENS.2016.7808530.